ITIL is the world’s most popular framework for IT service management (ITSM). The ITIL 4 Foundation syllabus is the first of the new ITIL 4 modules to be released by AXELOS. It offers a more holistic perspective of ITSM compared to ITIL V3, as well as several new tools and concepts. This ITIL course has been created in partnership with leading industry experts with many years of experience as consultants, trainers and authors of best-selling ITIL study guides. With a more up-to-date view of modern ITSM practices, ITIL 4 is much more practical than ITIL V3. Its release was also highly anticipated, especially given how virtually all IT-driven organizations now utilize ITSM to some degree. As such, gaining your ITIL Foundation certification will make you a highly effective and desirable ITSM practitioner. By the end of the course, students will be fully prepared to sit and pass the ITIL 4 Foundation examination. Students will also receive a FREE exam voucher for the official exam. 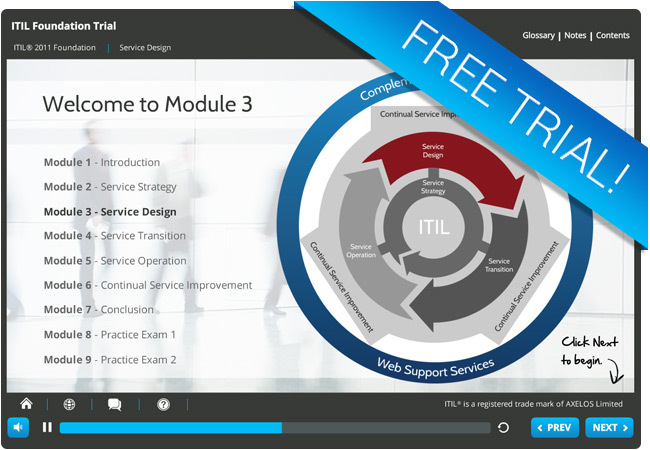 There are no prerequisites for taking this course but if you are already certified in ITIL v3, don’t panic! There are a number of ways to transfer over to the new certification path. For more information, visit our page – What’s new in ITIL 4? ITIL is the world’s most popular framework for IT Service Management (ITSM). The latest iteration of the framework, ITIL 4, offers a modernized and community-driven approach, with a variety of new ITSM tools, a renewed focus on the newest best-practices for ITSM and integration with other popular standards, including Agile and DevOps. This ITIL 4 Foundation course offers an excellent introduction to the new framework as well 6 months of access and a FREE exam voucher. Students will be able to demonstrate an understanding of ITIL 4, including new features like the ITIL Service Value System (SVS). Students who successfully pass the ITIL 4 Foundation examination will also be prepared to move on to the ITIL Managing Professional (MP) or ITIL Strategic Leader (SL) modules. Why Study ITIL® 4 Foundation with 4PA? This course is ideal for anyone looking to begin a career in ITSM, or build on their knowledge using one of the world’s most highly recognized ITSM standards. Guiding principles’ are recommendations which can guide organizations in any given circumstance, regardless of any changes made to its goals, strategies, type of work or management structure. The 7 ITIL practices can be used to support multiple service value chain activities. Together, they offer practitioners a versatile yet highly comprehensive toolset for approaching ITSM.